When developers started building the mass housing in Loughbourough Junction they often included Public Houses in their plans and one such was the Lord Stanley at 31 Hinton Road. It was taken on by George Ferris in 1869 who advertised this in a number of advertisements in the South London Press, the following from the 15 May 1869 issue. There was, though a hiccup in getting his license for the Lord Stanley as he was refused as this report in the Morning Advertiser 01 April 1869. On 29 September 1870 an advertisement for a Potman was placed in the Morning Advertiser . The excellent website http://www.pubshistory.com lists a change of Landlord in 1878 as Joseph Harbour became the licensee according to the Surrey Directory and again in 1896 this time from the Post Office Directory. Succeeded by Mrs I Harbour in 1904. Followed then by Norman Geo. Nursey in 1911, Arthur Valentine Col in 1919, Joseph High Elliott in 1938 and Chas E Hills and Chas E Keating in 1944. Added: January 2016: Whilst browsing once again through the Lambeth Landmark website, featuring a part of the Lambeth Local history collection held at Minet Library on Knatchbull Road I came across this photograph. It features the top half of the Lord Stanley behind the wagon, taken from the north looking south down Hinton Road with Wanless Road branching off left. It is dated circa 1905 and came from an album of Bovril bill posting sites. 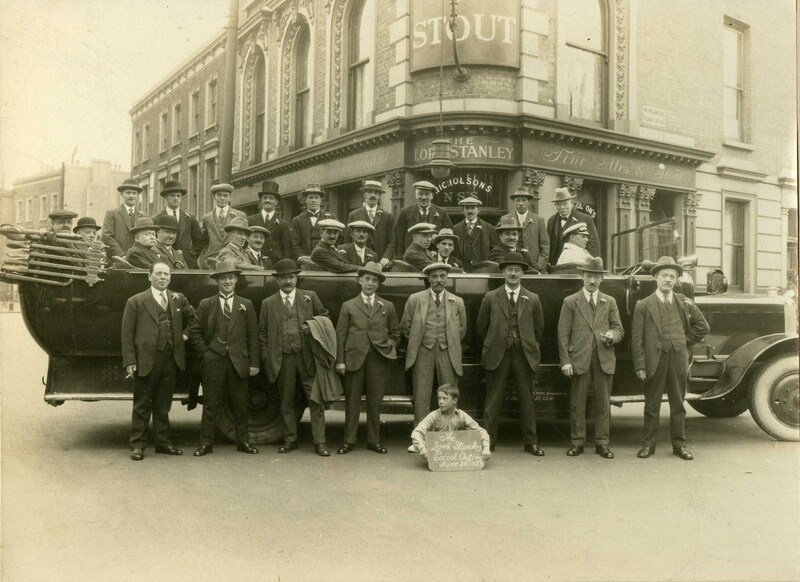 In early 2012, I had come across a early photo of a charabanc outing from the Lord Stanley on 28th June, 1925 on a Flikr account Eric06. By the time I went back it had disappeared but after I contacted him, he very kindly e-mailed it to me. Thanks Eric. This would be during the time of Arthur Valentine Col. I have absolutely no way of knowing but the gentleman standing on the far left with the cigarette just looks like a pub landlord. A contributor Gill recalls the pub during the war being run by Harry and Daisy Buck, helped by various members of the Buck family. She says the pub suffered bomb damage during the war but continued in operation. In 1940, as part of a Charrington Brewery survey the following photo was taken. The following photo of Tram 48 taken in January 1952 is part of the B. Maguire collection found on Chris Stanley Flickr. In the late 1970’s and early 1980’s on a number of occasions I had a drink or two in this pub with my friend Jeremy. It was very pleasant but quiet, I think the landlords name was Harry though not 100% sure. And I remember a bird cage. What I can’t remember is whether the housing next to the Lord Stanley on Hinton Road back to Wanless Road was there or if it was a bomb site. The pub closed around 1999 and was replaced as so many are these days by a new housing development called Lord Stanley Court. This entry was posted in Loughborough Junction, Pubs and tagged Hinton Road, Lord Stanley, Loughborough Junction, Pub. Bookmark the permalink.